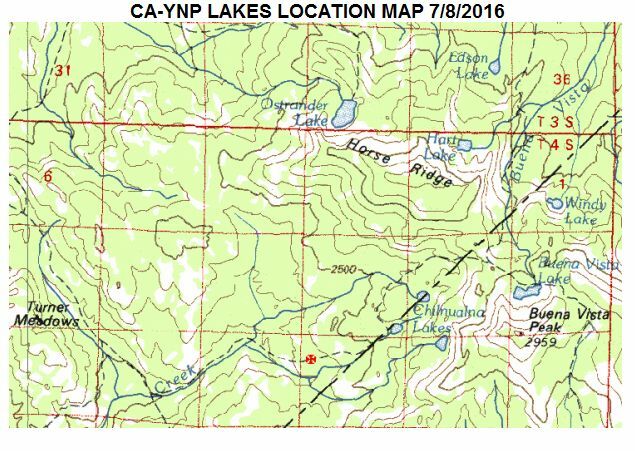 07/08/2016 - After receiving reports of smoke in the Chilnualna Lakes area, between Turner Meadow and Buena Vista Peak, fire personnel from Yosemite Crew-1 hiked into the area on June 7, 2016. A confirmed lightning strike tree was observed, which resulted in a 3.2 acre surface fire. The fire was described as smoldering and creeping in brush, timber and duff, with moderate spread potential. The fire is approximately 0.20 miles off the Chilnualna Lakes Trail, but there are no immediate threats to the area, or the hiking trail. At this time, the fire will be in a monitor status and Crew-1 has hiked out of the area. Lightning fires are a natural occurrence and play a vital role in shaping this fire dependent ecosystem. Each year, lightning strikes may result in multiple fires in Yosemite’s wilderness. By managing these fires for resource benefit, as opposed to suppressing them, we can ensure a healthier, more diverse and natural forest where future fires will burn with less intensity. Yosemite National Park Fire Information website: http://www.nps.gov/yose/blogs/fireinfo.htm.